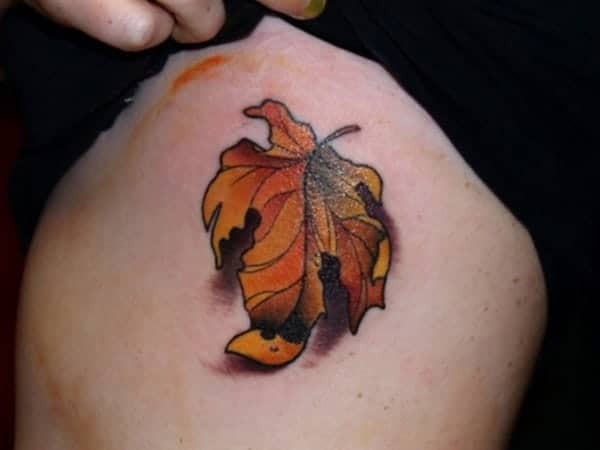 If you are looking for a new tattoo idea, then why not consider having a leaf design. 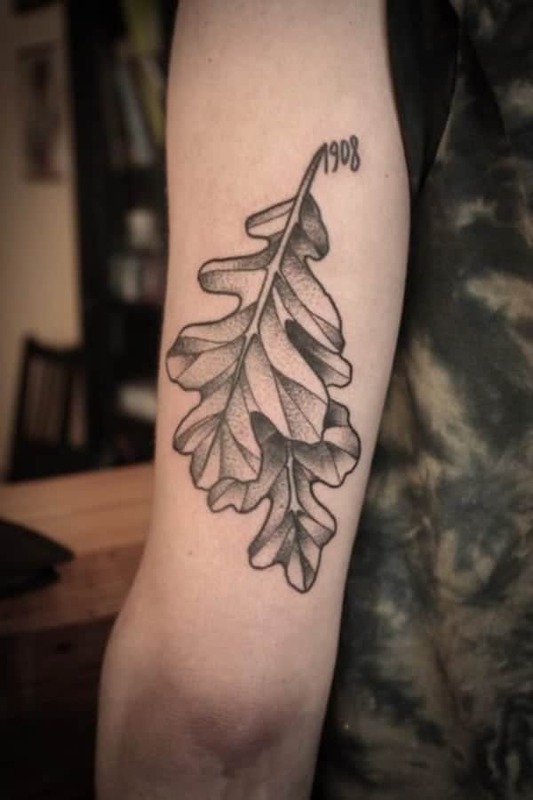 There are many tattoo designs that have gained popularity over the years, and the leaf tattoo is one of them. They tend to be eye-catching as well as darn right cute. 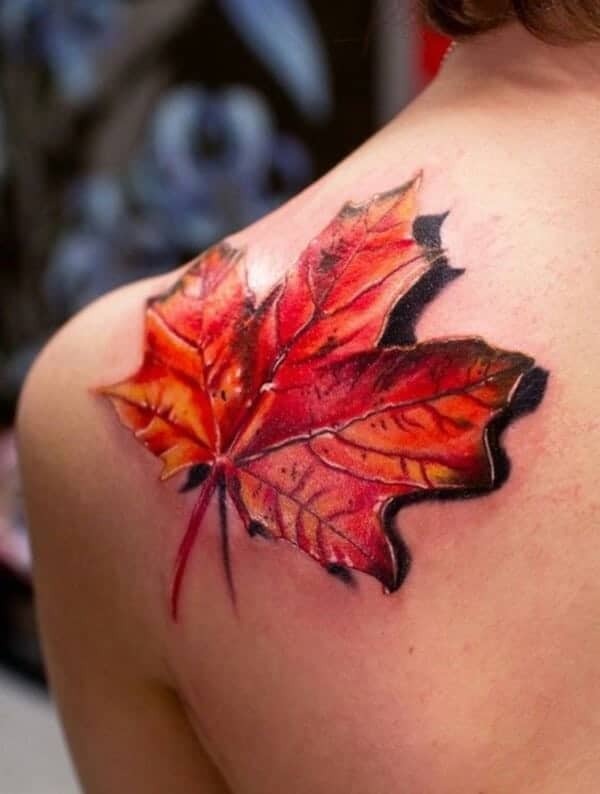 There are many different design choices when it comes to the leaf, many of which include the maple leaf, the darling aspen leaf or even for those men out there the tough looking oak leaf. 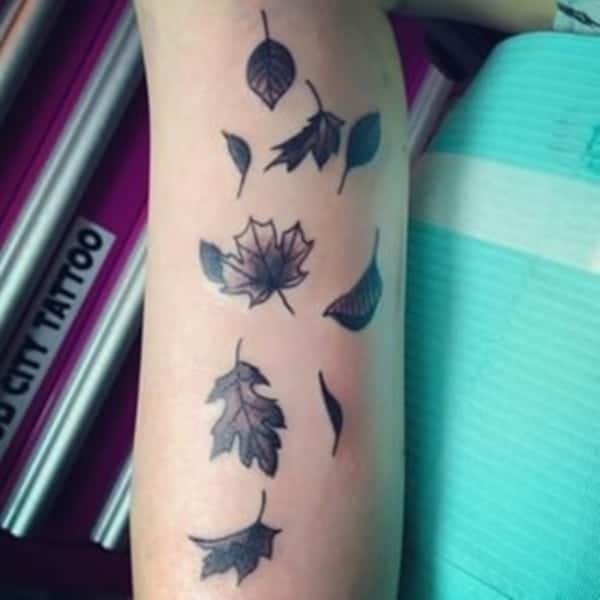 Though there is no reason to stop there, any type of leaf can be made into a tattoo and other elements can be added to it as well, the sky is the limit for you. 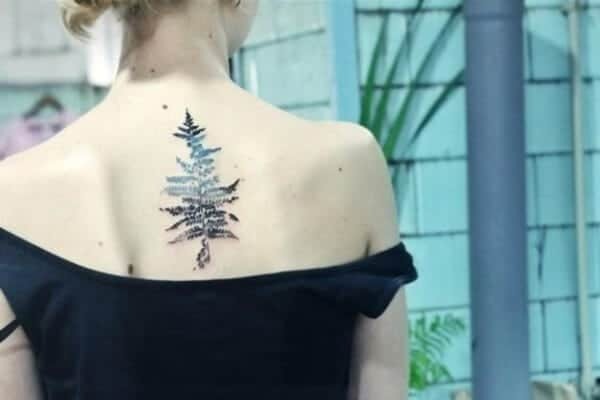 Many people choose the leaf design because of the cool designs they can make out of it but also because of the symbolism behind the leaf tattoo. 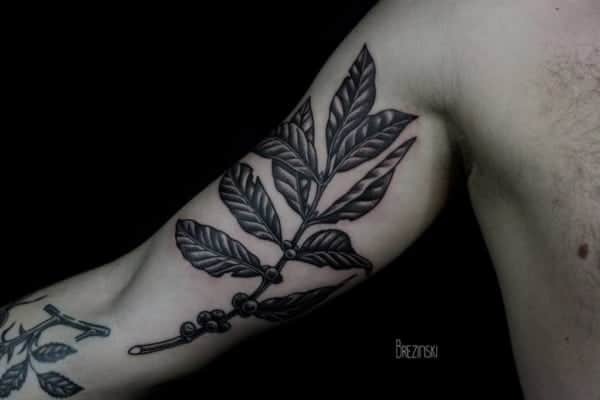 This shoulder tattoo consists of a branch of leaves and some berries dangling from it. These bright green leaves are certainly eye-catching, and they look wonderful on the back. The coloring is just amazing. This leaf appears to be cut out of the skin to show a city underneath. It’s definitely a creative design that shows a lot of character. It’s probably showing the city in which the person lives. 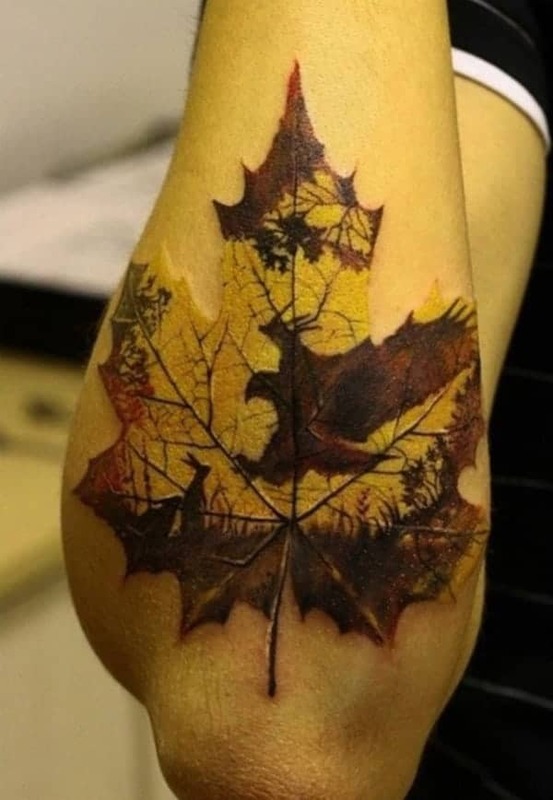 I love the coloring most on this tattoo; it just reminds you of the autumn leaves. 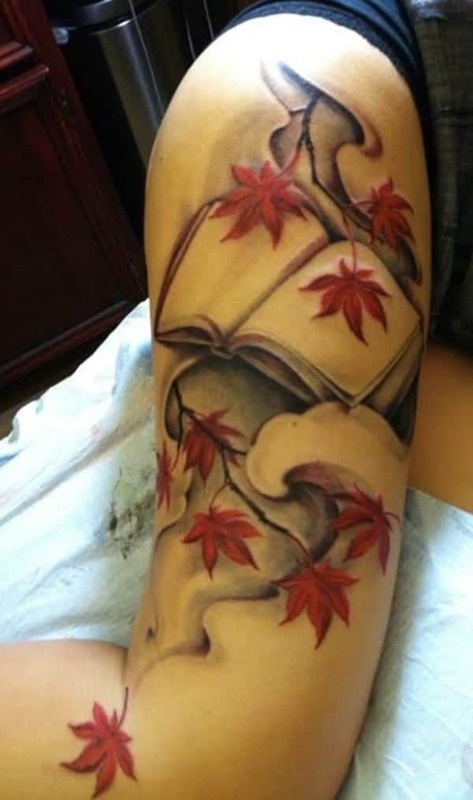 The best part of this tattoo is the cherry blossoms, and the bright red leaves. 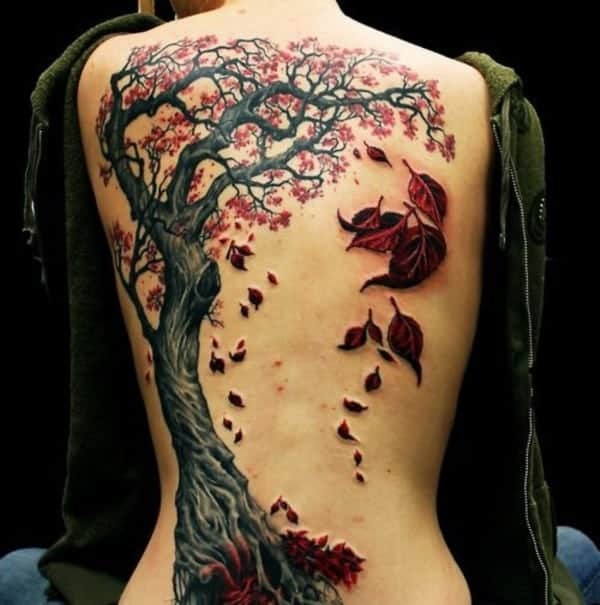 They are falling from the tree, making this tattoo rather extraordinary. 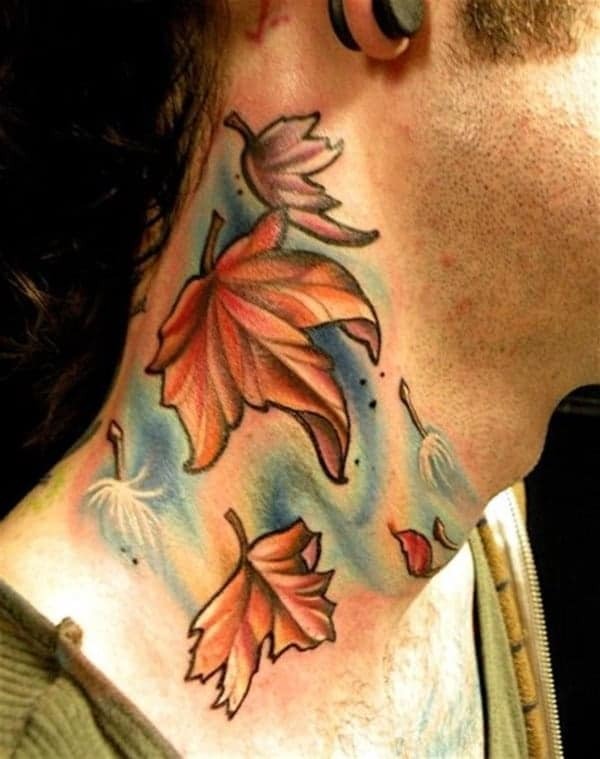 I love the colors on this tattoo, and the yellow makes it pop off the skin as if the tattoo is embossed. 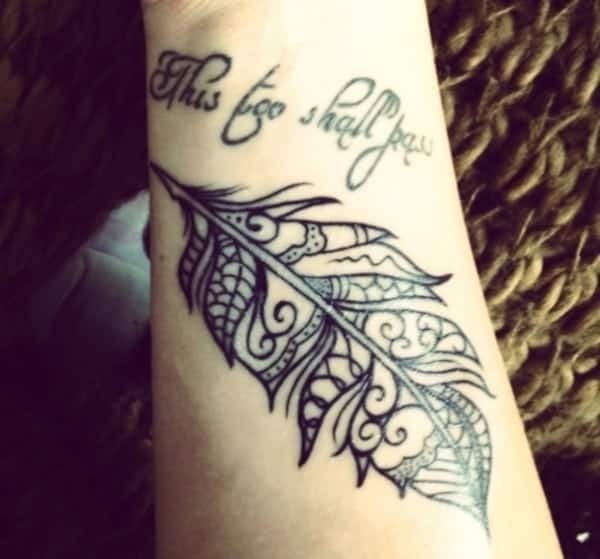 This unique tattoo design goes from one wrist to the other. The birds seem to be flying out of the leaf. 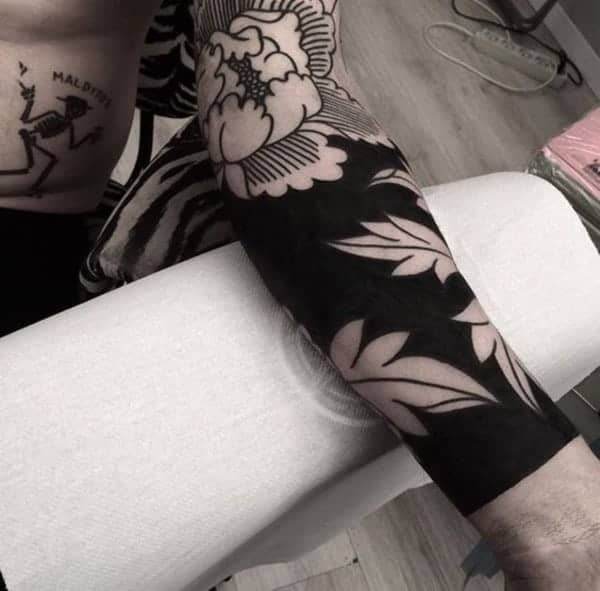 This tattoo has many different elements to it; there are wild animals amongst the jungle leaves. 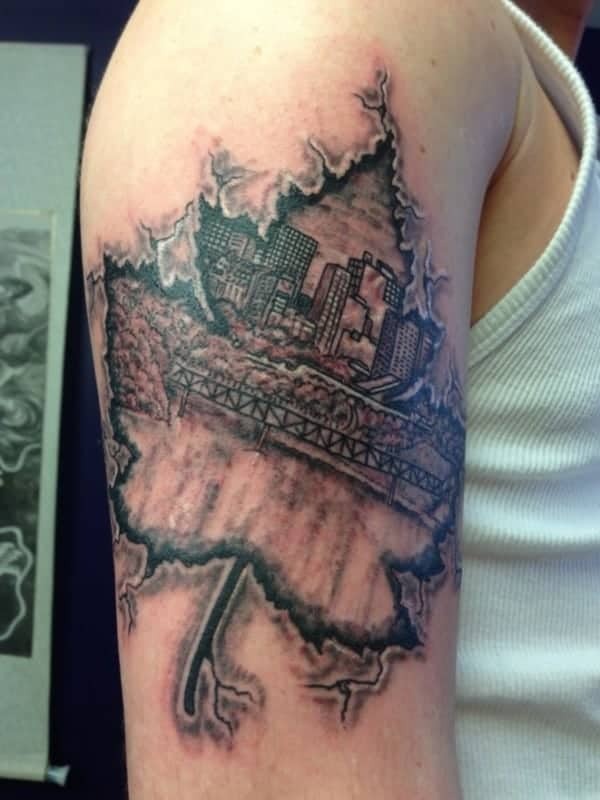 This is a great design that shows the leaving falling down the arm. 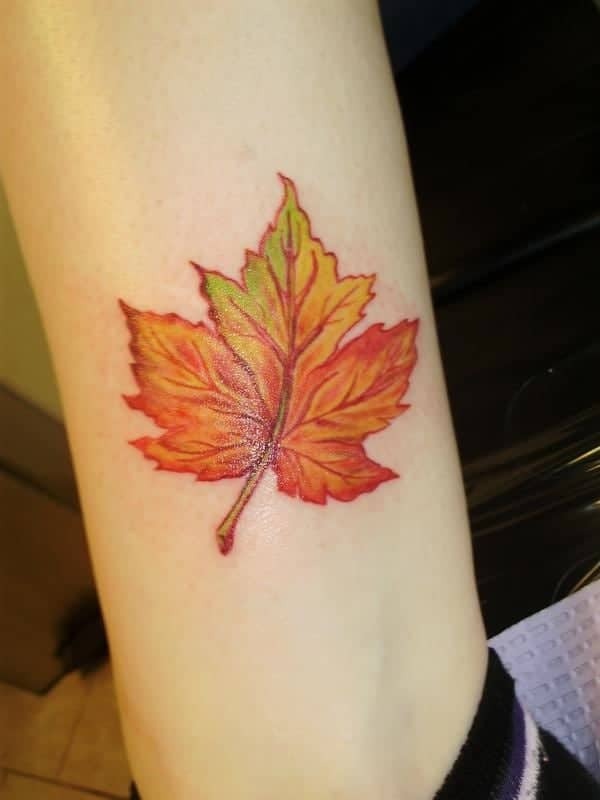 This bright red leaf is an awesome design and it’s lifted off of the skin by a shadow. This unusual leaf design is made even wackier by the neon colors inside of it. It definitely creates an eye-catching design. 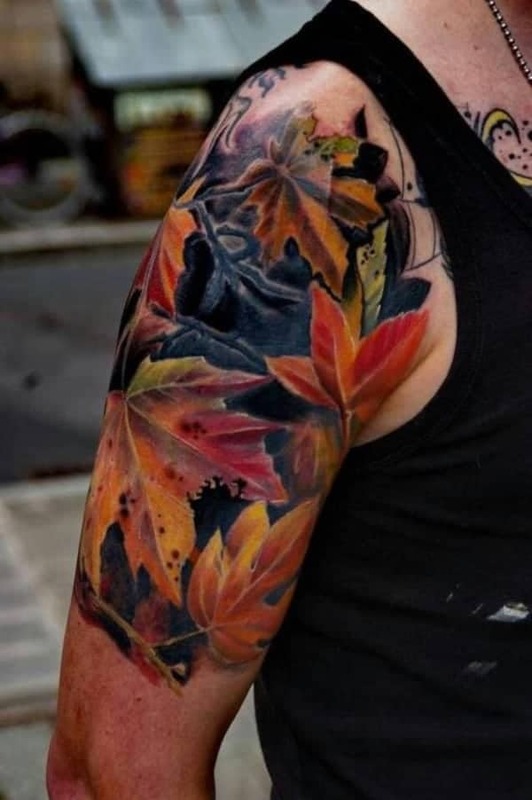 A sleeve tattoo design that has many different leaves of various colors. 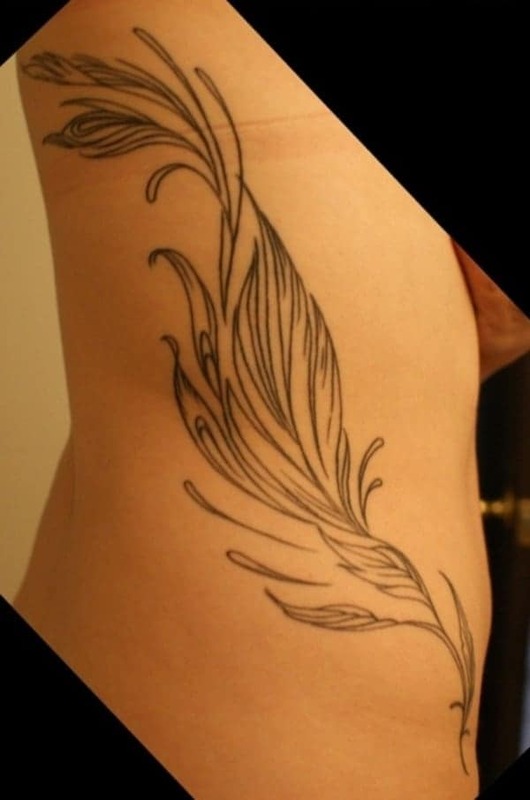 If you are looking for a badass design, then look no further than this ribcage tattoo. 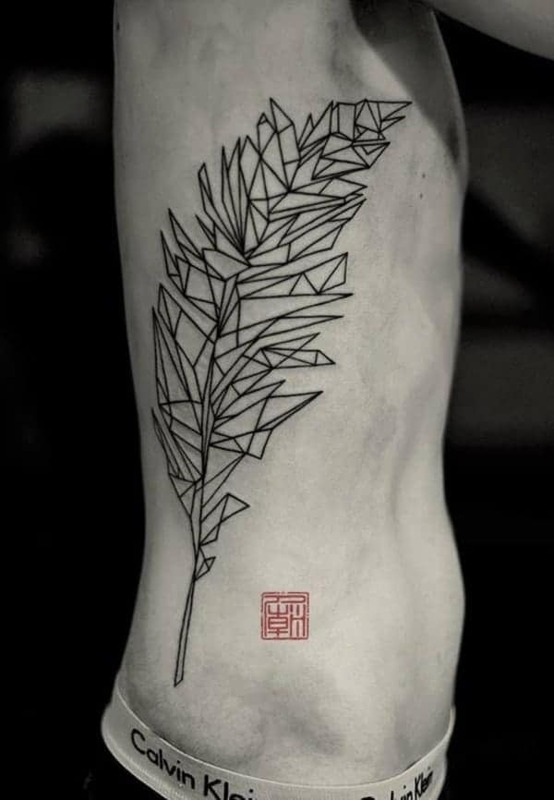 It’s a geometric design that creates a leaf out of geometric shapes. Truly unique and creative. 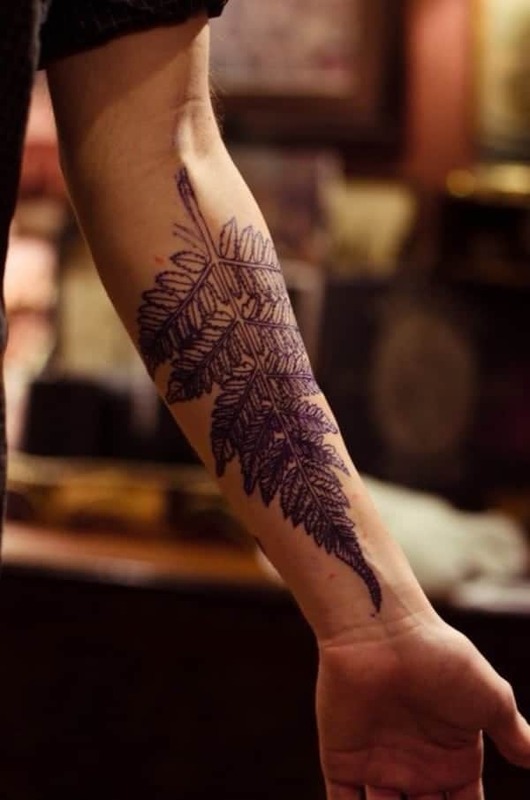 This large purple leaf takes up most of the arm; its coloring is quite nice. 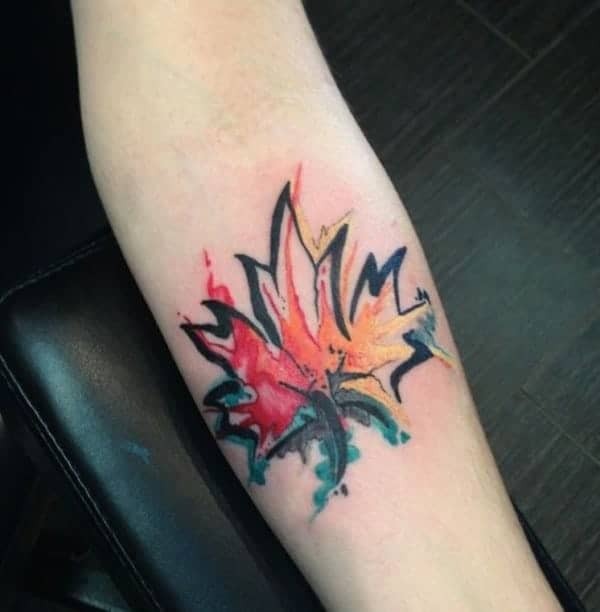 A different take on the Canada leaf, this one looks like it’s caught on fire. 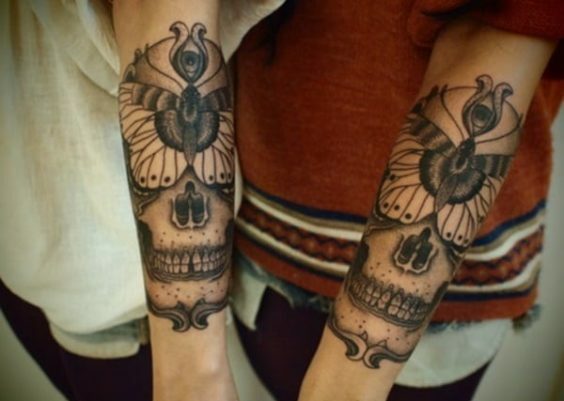 The sketchiness of the tattoo makes it different. 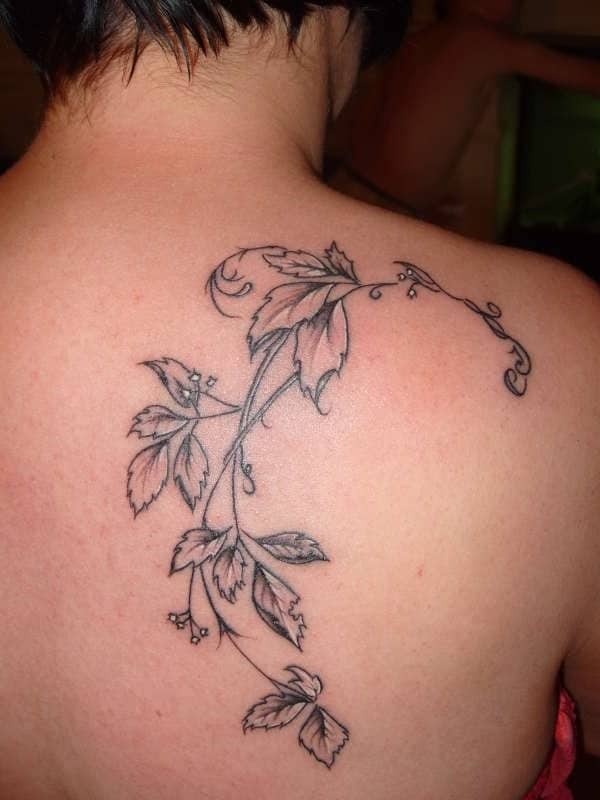 This is a great example of how other elements can be added to a leaf design to create a fuller tattoo. 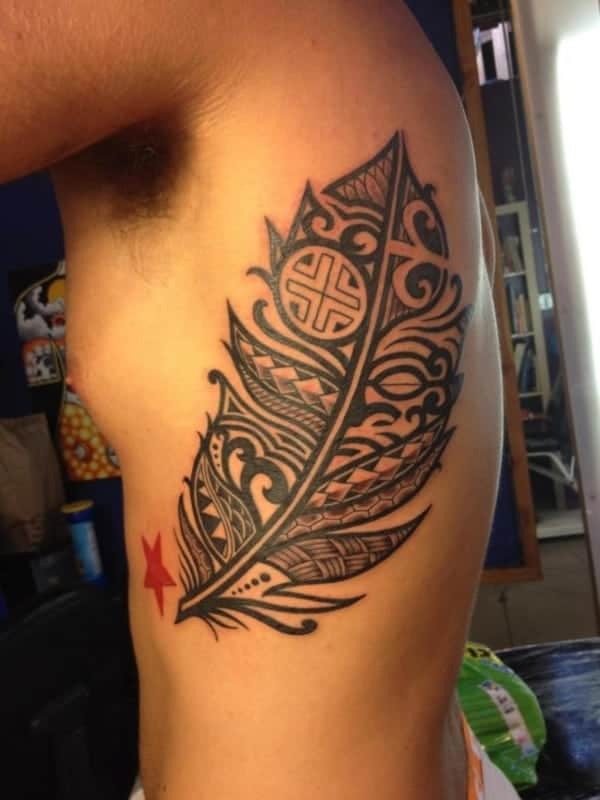 A great black and white design that goes from the shoulder down the arm. Who says you have to choose between two different leaves? Why not have both of them? 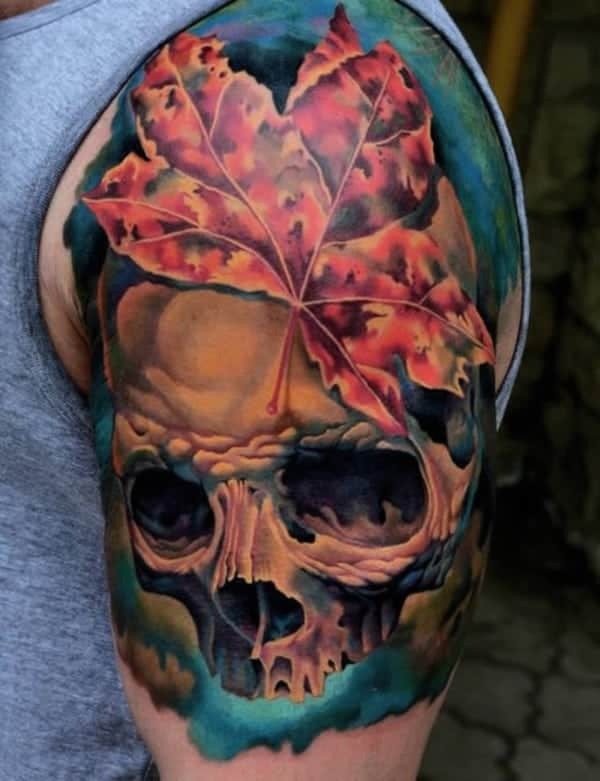 A truly creative design that implements a skull inside a leaf. It’s an original design that gives off a badass vibe. 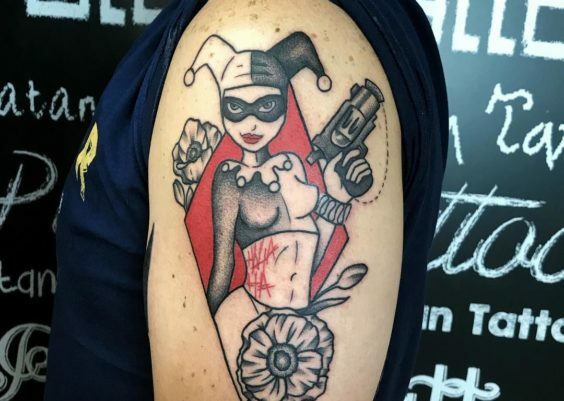 A great design that has the tattoo angled to fit her arm perfectly. It’s a wispy design that reminded me of field flowers. If you are a lover of this weed, then shout it from the rooftop. 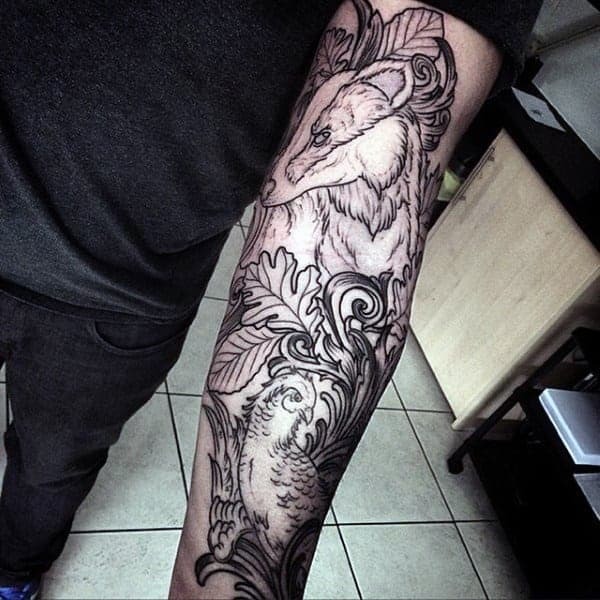 If you want something less detailed and more whimsical then try out these designs. There is a lot of blacked out areas so make sure you want the commitment. In this case, they may have been covering up another design. 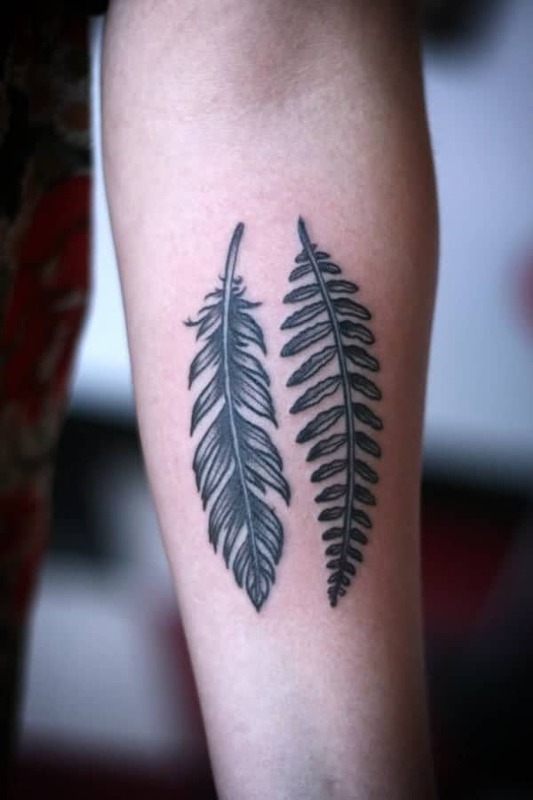 If you love tribal tattoos, then this would be a great way to incorporate it into a leaf tattoo. There are many creative elements to this design. 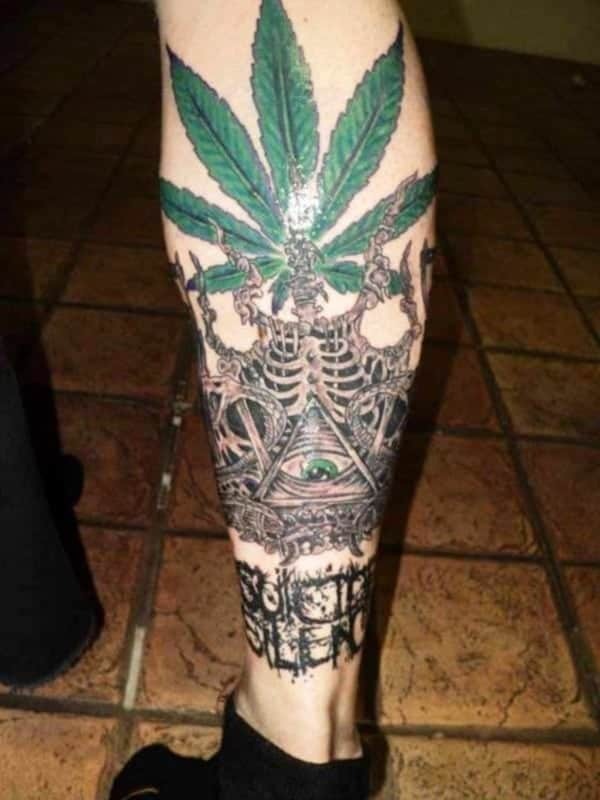 A very unique tattoo indeed. Dew drops on autumn leaves that have fallen to the ground. The colors really pop on this design. 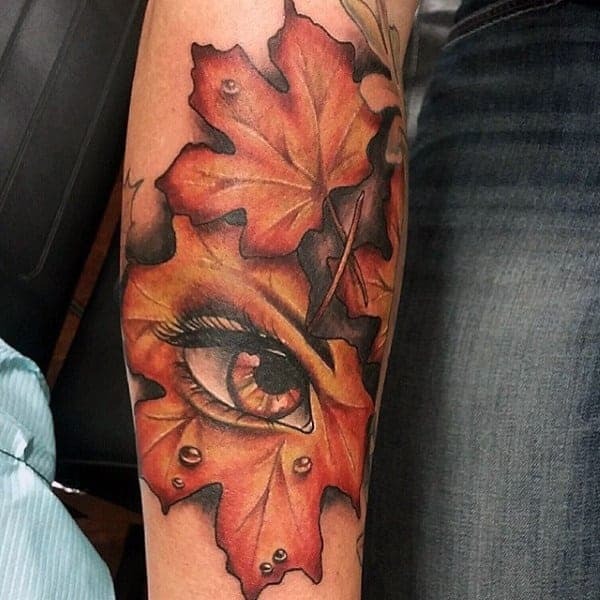 The eye is so realistic and beautiful that it’s like it completely belongs there. 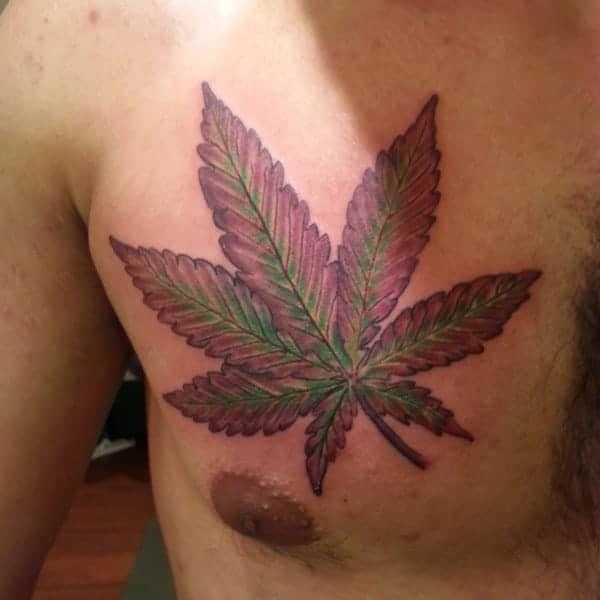 Another example of a cannabis leaf that shows some pretty colors. 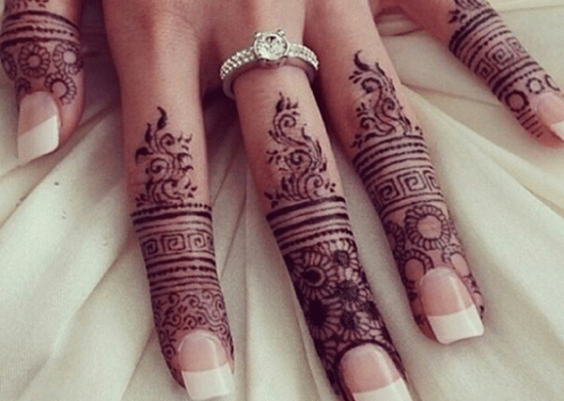 This great design is very soft and feminine. The coloring is also very subtle, not the type to pop off the skin. 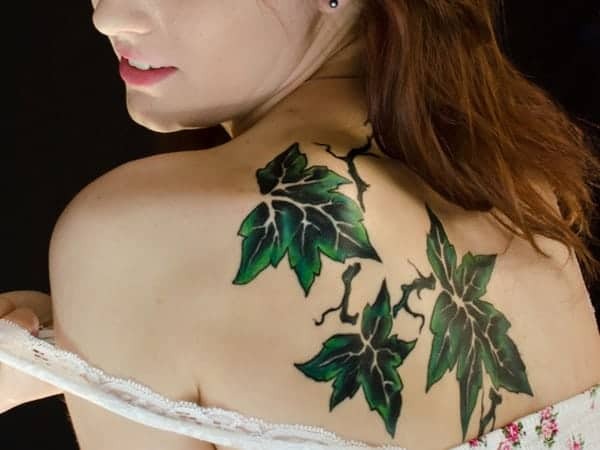 A full back tattoo consisting of some bizarre looking neon green leaves that seem as if they are out of a dream, or maybe a nightmare considering there are some snake eyes involved as well. 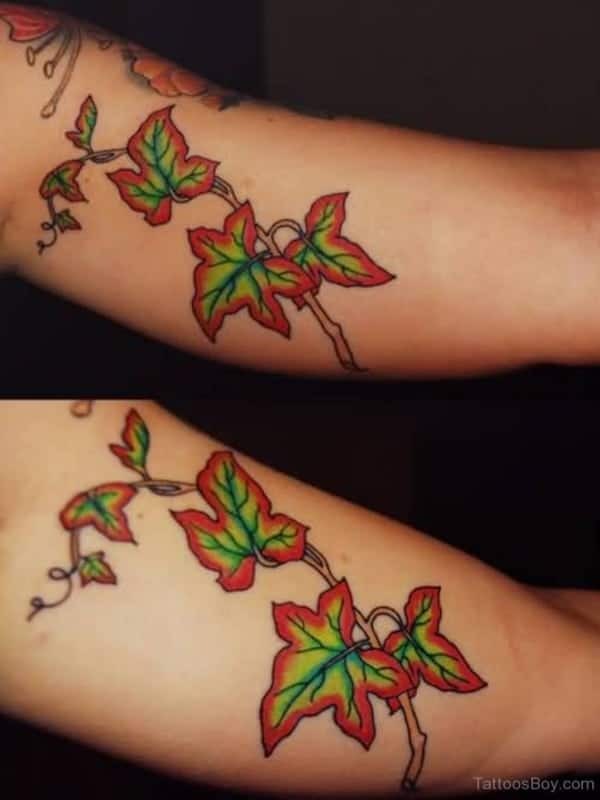 These bright leaves are placed on both arms for added effect. 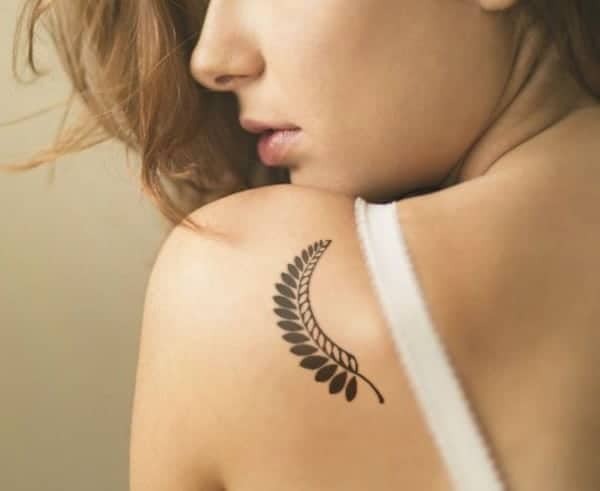 This leaf design is quite small and elegant. 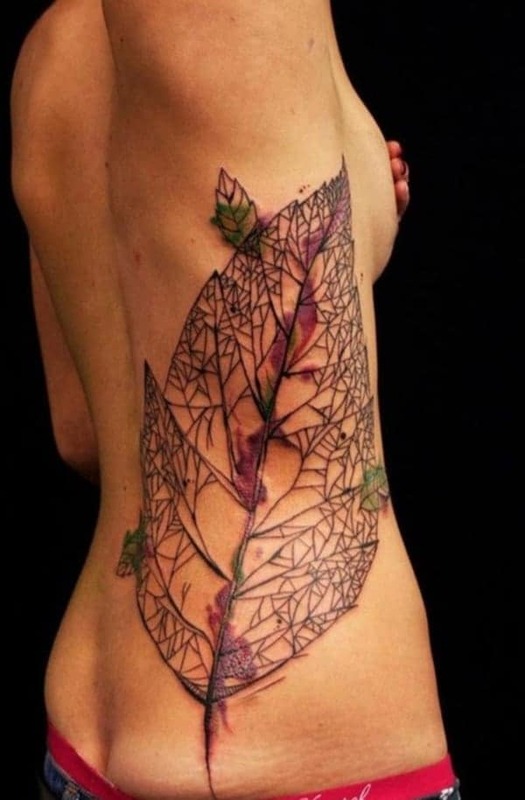 This leaf design is along the ribcage, and it’s quite a creative tattoo. 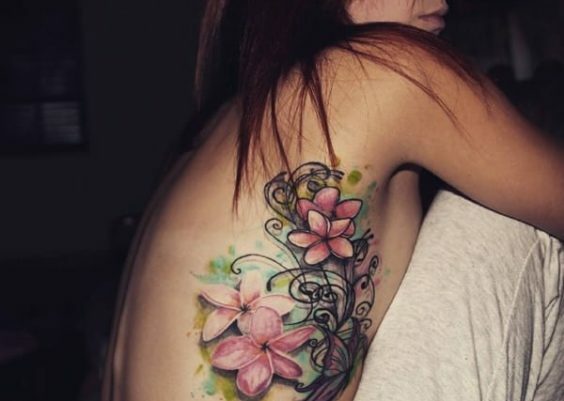 The purple throughout is very beautiful, and it falls completely along the ribcage. 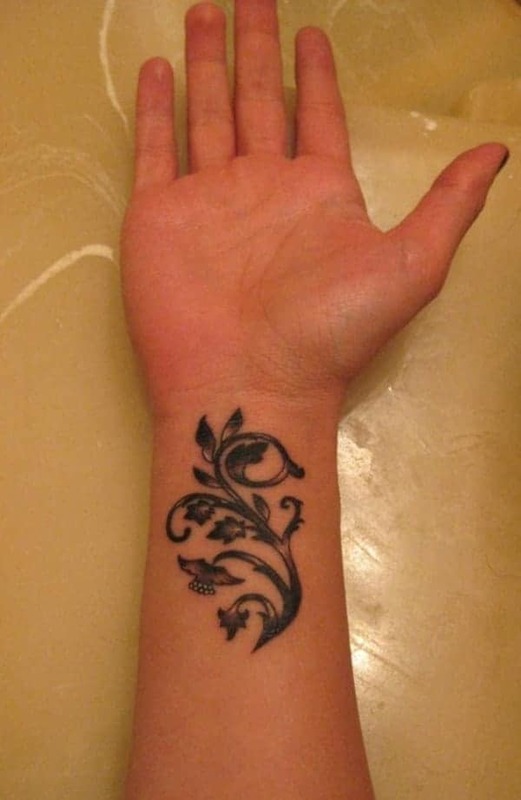 If you are looking for an unusual design that is large, then this might be the tattoo for you. 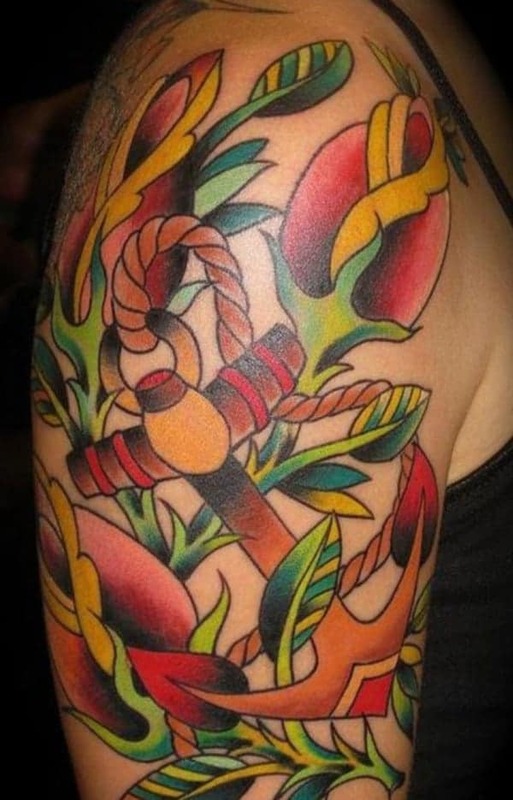 This bright and colorful design has many elements with the leaves including flowers and an anchor. 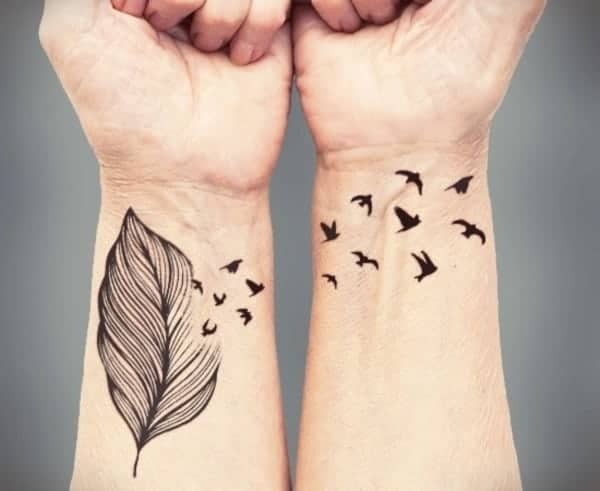 A small design that can be placed anywhere on the body, it’s a sweet design. 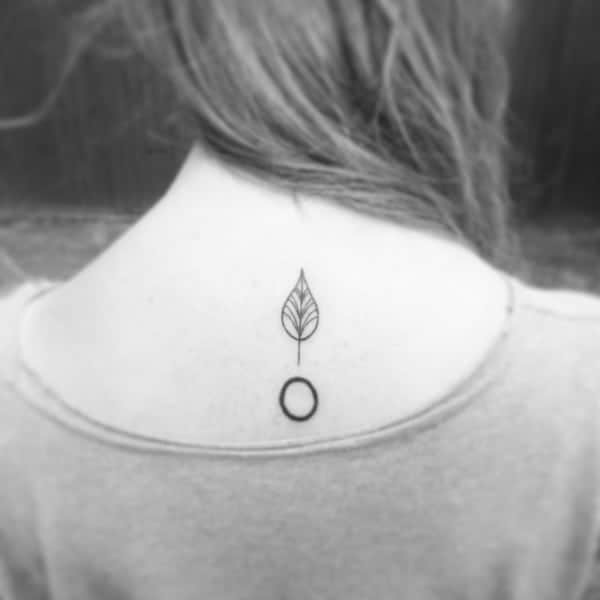 A great tattoo design that is sweet and simple. If you like a standard green leaf, then try this one out. These bold colors are sure to be eye-catching. There is also the element of the ribbon flowing through the whole design. 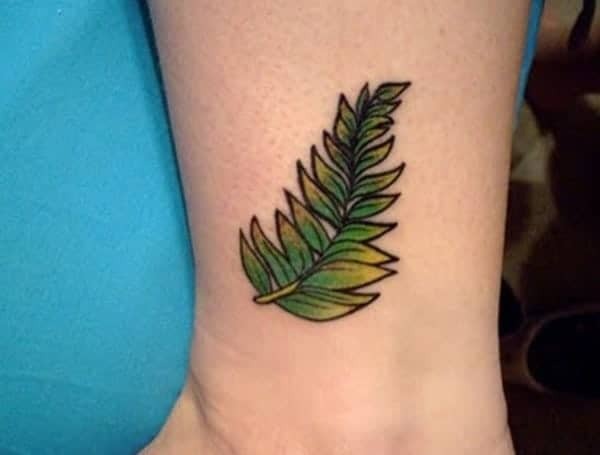 If you want to take your leaf design to a whole new level, then try this them out. It’s still a leaf, but it’s been molded into a very creative and cool design. If your idea of relaxing is reading a book out in nature, then this might be the perfect design for you. 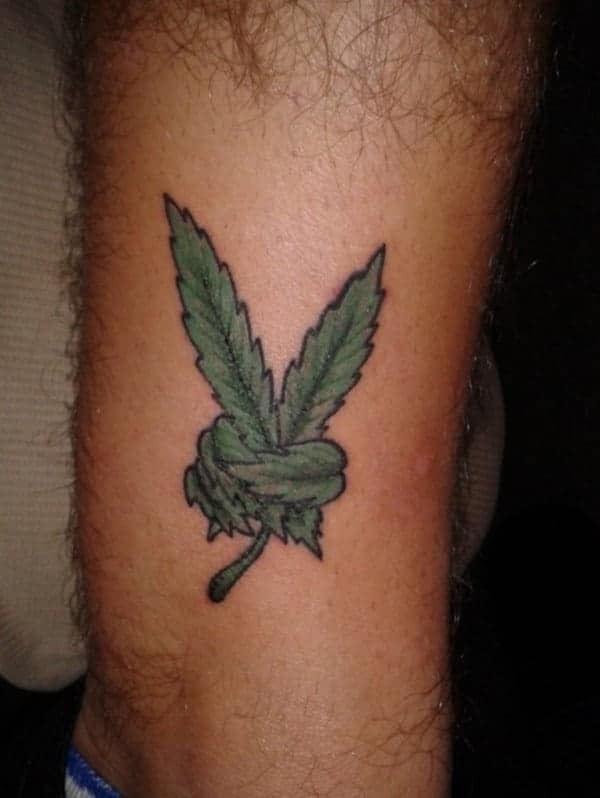 This cannabis leaf just wants to see peace in the world. 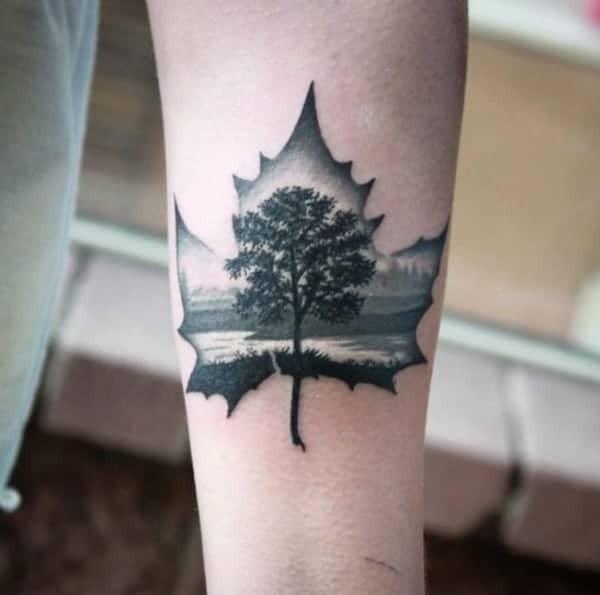 If you are looking for a unique design with this particular leaf, then this might be the one for you. 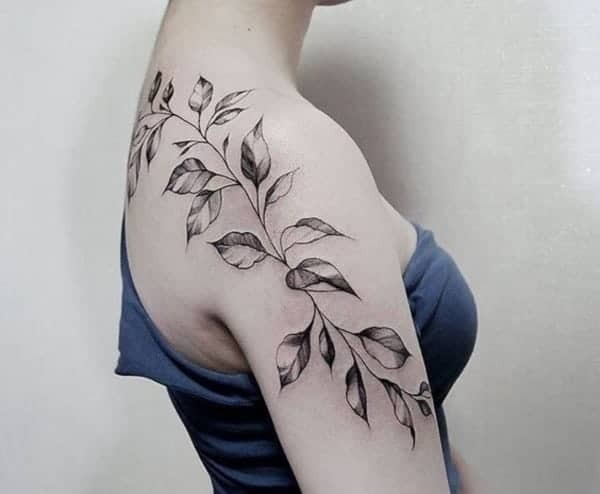 Ivy leaves always have a mind of their own and if you want to speak if your own independence then this feminine leaf design might be the one for you. 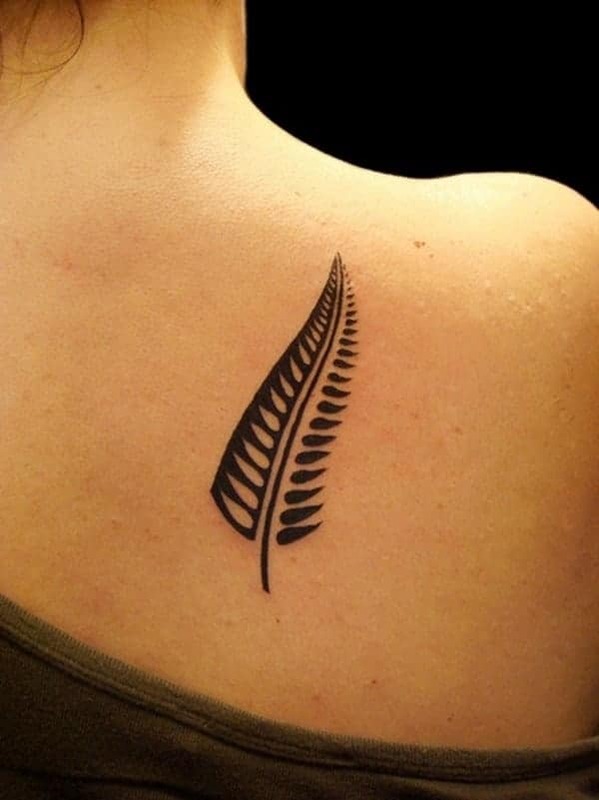 A great design that fits perfectly along the ribcage. If you are looking for a small design, then look no further. 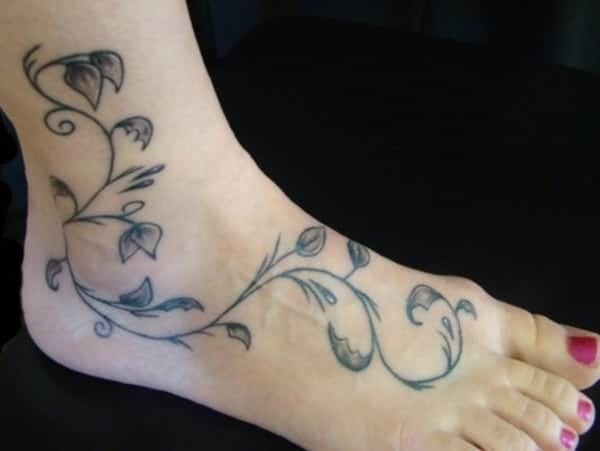 This subtle design has flowers and leaves. A unique flag design that has the Canada flag coloring inside it. It’s unique and wonderful. 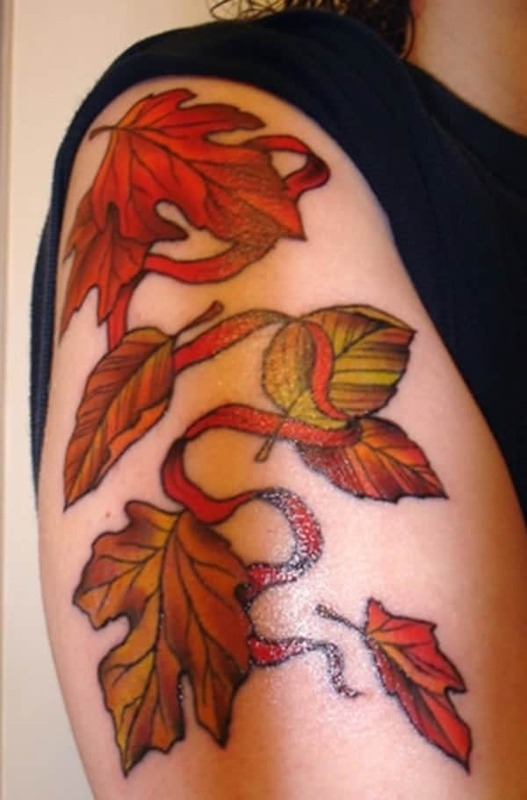 A great leaf design that goes down the arm, and there are some added berries to it. These pretty leaves are falling, and there are many bright colors involved. These colors are stunning, yellow, orange and red all together to create a wonderfully fiery color. A message that is great that incorporates a leaf. This is an unusual design that has many different elements to it. 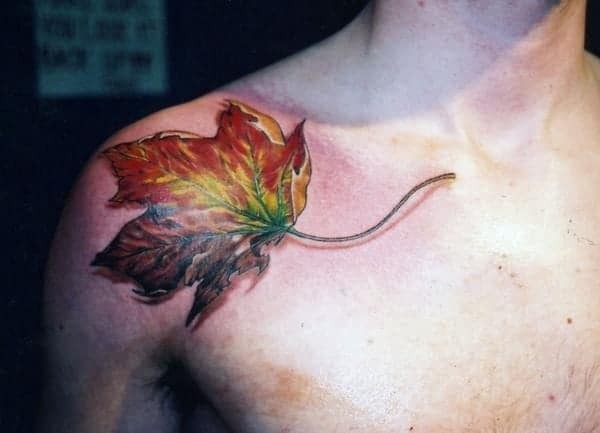 A great colorful leaf that sits perfectly on the shoulder. 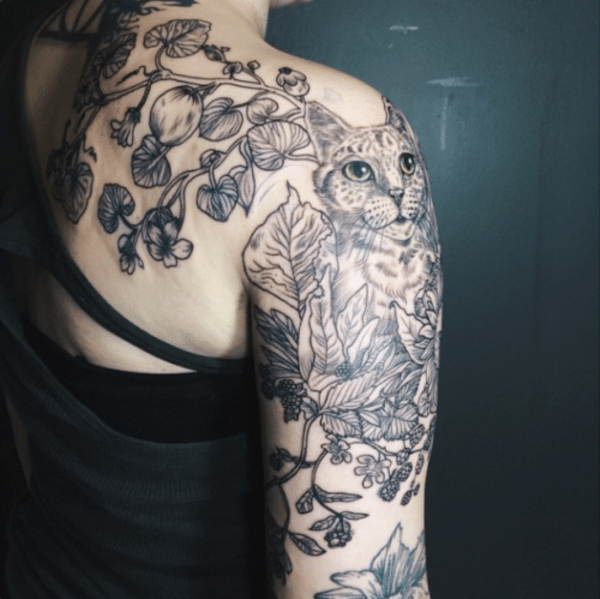 This design has a cat in a tree, and she’s surrounded by leaves and flowers. 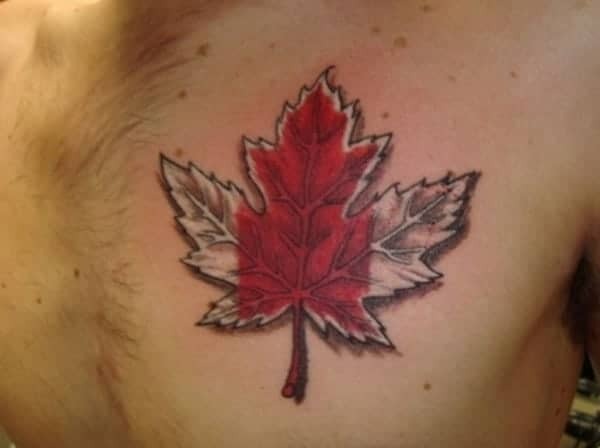 It’s a back tattoo that also goes down into a sleeve as well. One long skinny leaf that trails elegantly down the spine. 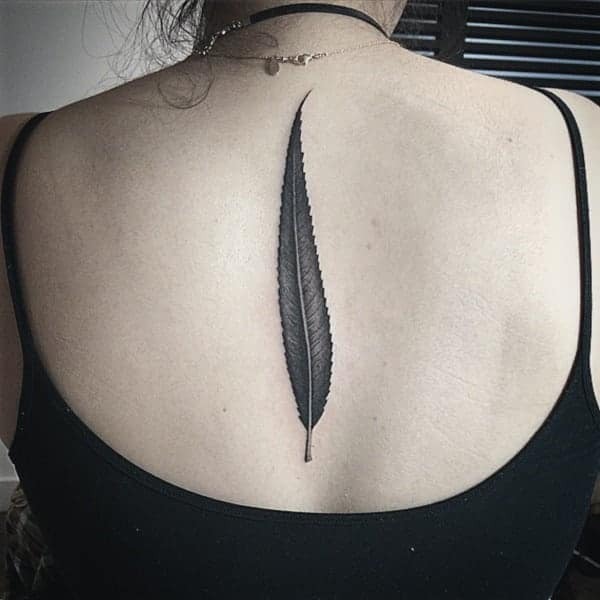 It’s a great black tattoo design that really stands out. This black and white leaf has scenery on the inside of it. It’s a beautiful design that you are sure to love. 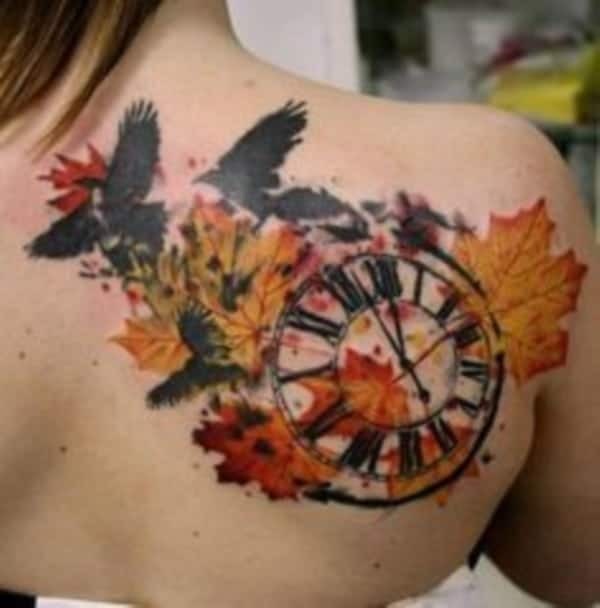 A stunning design that has very colorful leaves and other elements such as crows and a clock. It all goes well together to create a unique design that looks very cool. 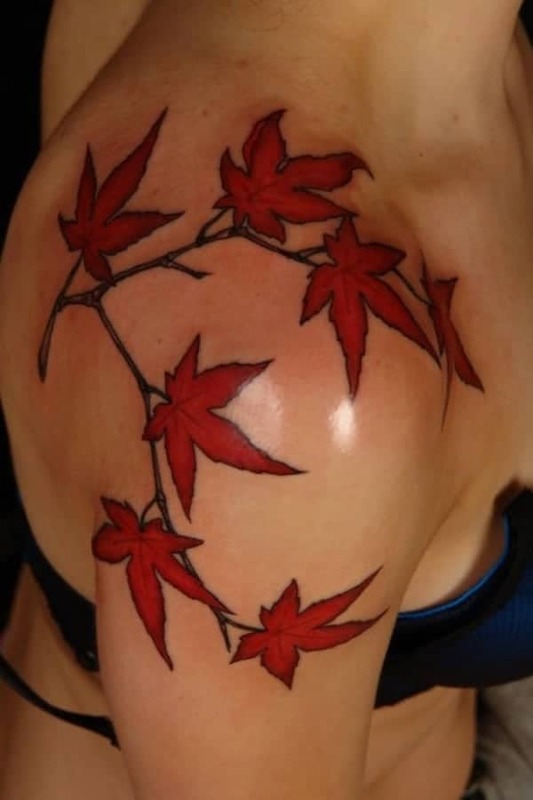 These red leaves go down the arm looking bold and beautiful. This leaf has some symbolism to the owner because of the date; it must be an event from the past or a grandparent since it goes way back to 1908. 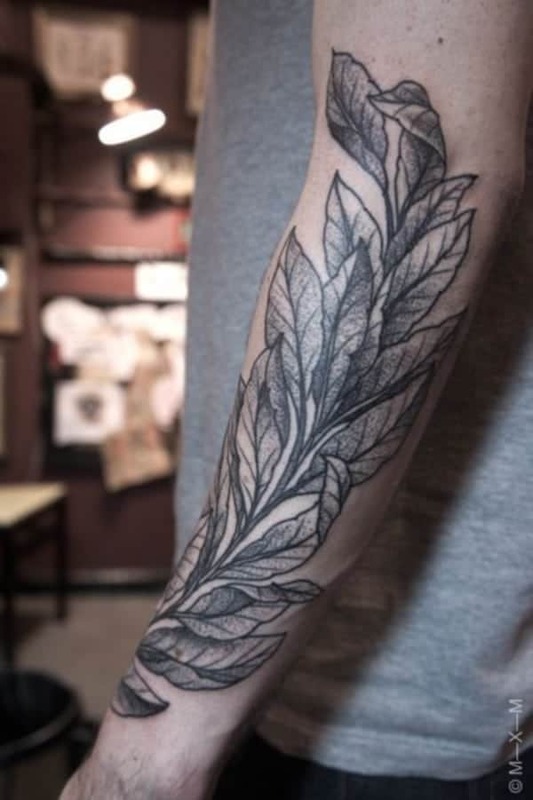 A great leaf design that is large and goes the length of the arm into a sleeve. 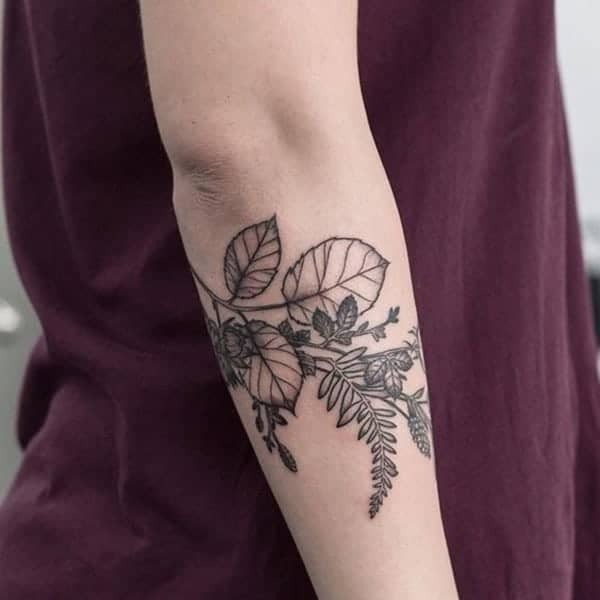 A small leaf design that has rounded leaves and some flowers to it. Another great example a large leave that has an unusual design. It’s a great design that is full. 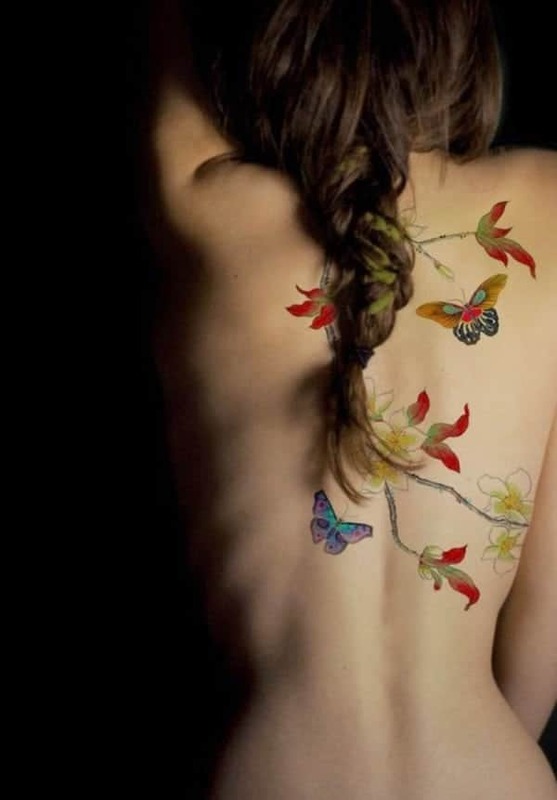 These colorful leaves trail all the way down the body cascading around her hips and waist. 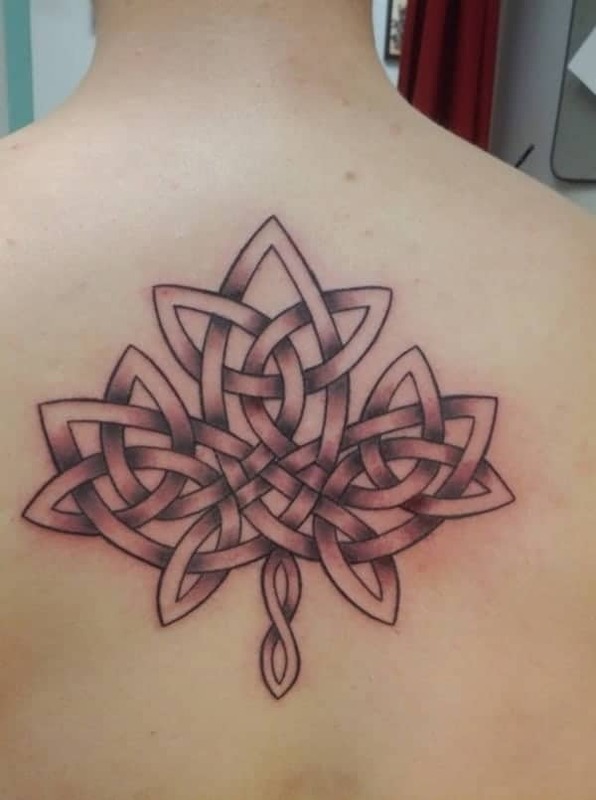 This shoulder design is sweet and simple. It’s the perfect design if you want something small. 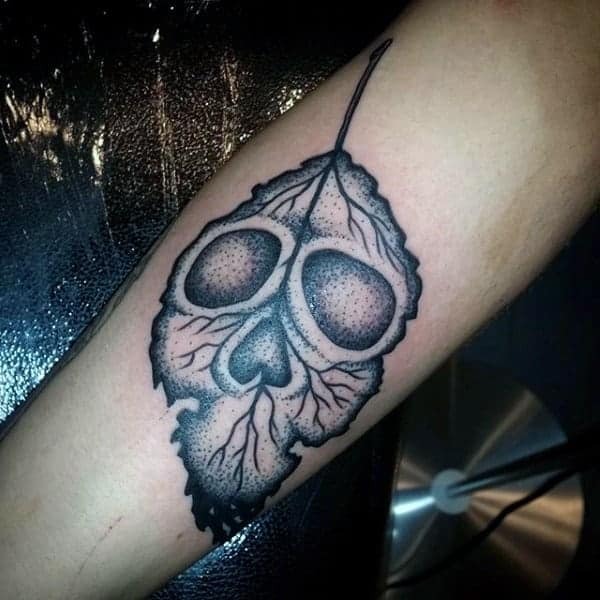 This large skull design has a deteriorating leaf on the top. 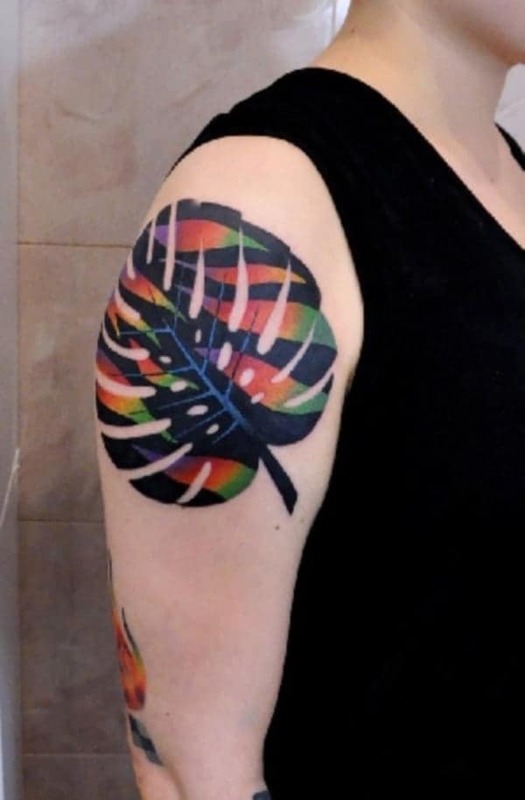 It’s still very colorful, and the tattoo itself is very large. 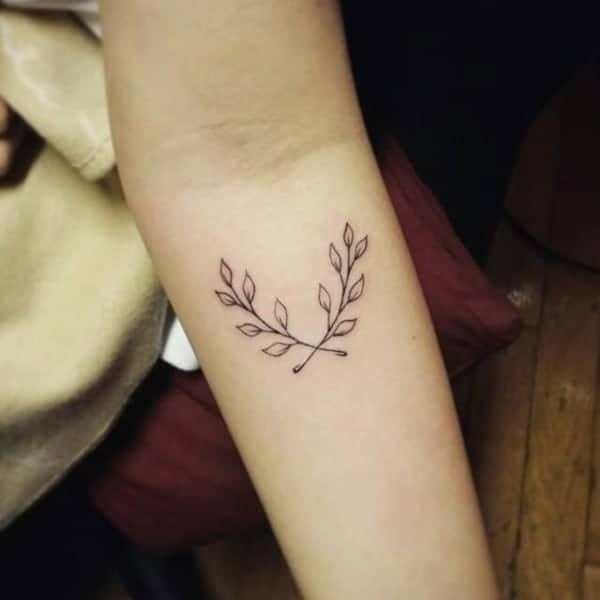 A small wrist tattoo that is simple and elegant. 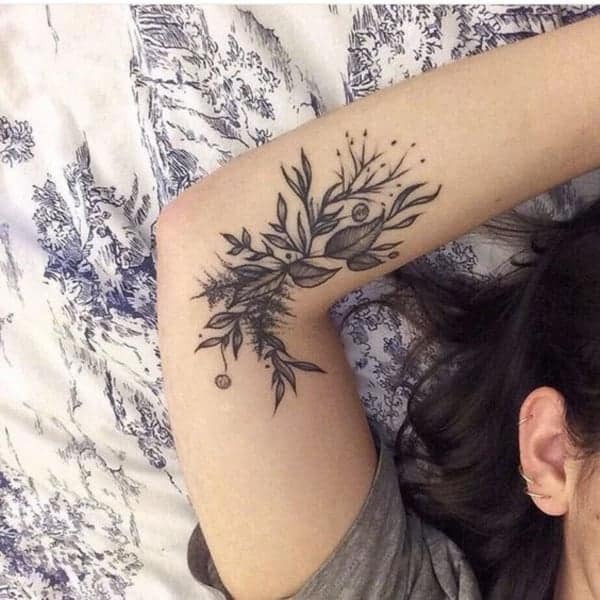 If you want a unique tattoo, then this cute design might be the one for you.